From cupids to angels floating over the beds of children, I think our culture has made angels into Tinkerbell. Nothing could be farther from the truth if angels were involved in “putting the law into effect.” These messenger/warriors work directly with God’s anointed on Earth. They are formidable. I have a friend who believes she saw an angel in her house while she was in prayerful intercession for her adopted toddler who was being pulled from their family and returned to his bio-father. She said the angel was more male than not, but also gender neutral. The angel was tall and barely fit in her dining room. 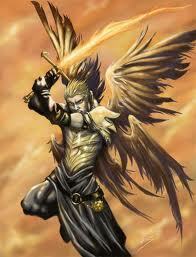 He stood in what she interpreted as warrior regalia, including a sword. He stood as a though he were a guardian. He stood watch. At the time, she thought the angel was a sign and they would keep their son, but that was not the case. Apparently, there was some other danger in this situation. And although this was one of the most devastating circumstance, she experienced the power of angelic presence. Apparently, angels do not just appear to anyone. They are God’s worker bees and they have purpose. They are sent. They interact with humans as needed. Angels cannot be prayed to or called upon. I’m thinking that people who think they have had experiences or manifestations on earth with Christ or the Holy Spirit, may have actually had contact with an angel. I have never seen an angel. But I have known people who I believe are mediators, who are totally submitted to the spirit of Christ, who have, indeed, been touched by angels. What about you? Do you have a story?